Born: 28 September 1854, George, South Africa. Died: 12 January 1936, Cape Town, South Africa. 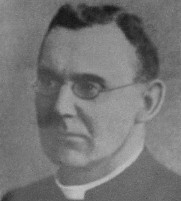 Friedrich Carl (Anglicised to Frederick Charles) Kolbe, Roman Catholic clergyman, author and educationist, was a son of the Rhenish missionary Reverend Friedrich Wilhelm Kolbe and his wife Isabella Maria Kolbe* (born Elliott), and a grandson of Reverend William Elliott*. He was a talented child, able to read the Bible at the age of four, though he suffered from weak eyesight. His father began teaching him Latin at the age of eight, but in 1862 sent him for his primary education to a school for missionaries' sons in Blackheath, near London. Here he headed the class in all subjects for five years, though his sense of fun got him into some trouble with the headmaster. At age twelve he had read Shakespeare's works and was learning Greek. He returned to South Africa in 1869, aged fifteen, and began his career as a teacher at his father's mission school with a salary from the Education Department. From 1870 he studied at the South African College, Cape Town, and while a student supported himself by teaching Latin at the College school and arithmetic to private pupils. In 1872 he was awarded a special scholarship for colonials by the University of London, after sitting for that university's examination in Cape Town. In 1874 he was one of the first batch of six students to be awarded the degree Bachelor of Arts (BA, in Literature and Science) by the University of the Cape of Good Hope (established the previous year), for studies through the South African College. As the top scoring candidate he was awarded both the University Scolarship in Literature and the University Scolarship in Science. His scholarships enabled him to proceed to University College, London, where he obtained the degree Bachelor of Laws (LLB). However, while on a visit to France in 1876 he converted to the Catholic faith and decided to become a priest. Proceeding to Rome he continued his studies at the English College there. He was ordained as a priest in June 1882, and a month later was awarded the degree Doctor of Divinity (DD) by the Gregorian University, with a thesis on miracles. Returning to Cape Town that same year he began his work as a trainer of teachers for Catholic schools, and chaplain to St Bridget's Orphanage and Asylum for the aged. He travelled a lot, lecturing at both Catholic and other schools, but by 1886 his hearing had become so poor that he had to stop teaching. He became a writer, philosopher, theologian and scientist, and in 1891 the first editor of the Catholic Magazine. During the rest of his career he was associated with St Mary's Presbytery in Cape Town. A man of enormous energy and intellectual power, he was equally at home in arts and science. For example, he compiled a Syllabus of a course of lectures on English poetry in 1892, and a Syllabus of a course of lectures on scientific measurement the next year. He was an examiner in literature and philosophy at the University of the Cape of Good Hope for twenty years and served on its council from 1885 to 1918. He was also a government representative on the council of the South African College from 1891, and from 1918 a member of the council of its successor, the University of Cape Town. Kolbe's interest in botany brought him into contact with leading botanists such as H. Bolus*, P. MacOwan*, Rudolf Marloth*, I.B. Pole-Evans* and General J.C. Smuts*. From 1908 to 1910 he undertook a teaching tour of Catholic schools in South Africa and Rhodesia (now Zimbabwe) and used the opportunity to collect some 400 plant species. He built up a herbarium of some 5000 sheets (many obtained by exchange), which is kept at St Mary's Dominican Convent in Cape Town. In 1901 he received duplicates of Dr C.W.L. Pappe's* collection of horticultural plants from the government botanist, for teaching purposes at the St Mary's School. The species Amphiglossa kolbei was named after him by H. Bolus. In 1910 he read a paper on "Leaf protection in Oldenburgia arbuscula DC" before the South African Association for the Advancement of Science (Report, 1910, pp. 450-459), followed two years later by "Floral persistence under special conditions" (1912, pp. 101-102). Kolbe's interest in natural history and his collecting activities included insects and other invertebrates and from 1894 he made regular donations of specimens to the South African Museum, Cape Town. In 1897 he was present at the opening of the railway to Bulawayo and used the opportunity to collect 76 species of insects (mainly Coleoptera) and some land invertebrates (mainly Myriapoda) after the first summer rains. Three of the insect species and most of the myriapods were new to the museum's collections. The next year he presented two lizards, a snake, some spiders and scorpions, a few marine invertebrates, and a sample of prehnite (a silicate mineral) from Carnarvon. In 1899 he collected at Kentani, Transkei, where he met Alice Pegler*. Thirteen of the Coleoptera and two of the Orthoptera species collected there were new to the South African Museum, while one species of Neuroptera was new to science. His collection also contained many rare spiders, 28 species being new to the museum. More insects from Umtata and spiders from Tembuland (Transkei) followed the next year, and in 1902 new trapdoor spiders and their nests, also from the Transkei. Kolbe was a foundation member of the Mountain Club of South Africa in 1891. He joined the South African Philosophical Society in 1896, and remained a member when it became the Royal Society of South Africa in 1908. By 1903 he was also a member of the South African Association for the Advancement of Science, serving on its council for 1908/9. The papers he read before the association, published in its annual Reports, reflect his wide interests and expertise, for example. "How we get knowledge through our senses" (1903), "Presentment and proof in geometry: a study of the associated circles of a triangle" (1915), "Some sense defects psychologically considered" (1917), "Some experiments used in the rudimentary teaching of botany" (1918), "The nine-points circle - a note on Feuerbach's Theorem" (1919), and "A diagrammatic conception illustrating the psychology of mysticism" (1930). Despite his various contributions to science Kolbe believed that science provided only quasi-explanations, and that fundamental insight into the nature of reality could only be achieved through religion. He was the author of many insightful articles, several poetical works, two volumes of stories for boys and girls, and several other books, including The art of life (1903, a collection of articles written for the Catholic Magazine); Up the slopes of Mount Sion (1924, his spiritual biography); The four mysteries of the faith (1926, his definitive statement of his religious point of view); A Catholic view of Holism (1928, a criticism of J.C. Smuts's Holism and evolution); and Shakespeare's way; a psychological study (1930). As an authority on Shakespeare some of his papers were read before the London Shakespeare Society. He was art critic of The Cape, and his efforts contributed to the establishment in 1920 of the Michaelis School of fine Art at the University of Cape Town. His collection of the works of South African artists was presented to the University of Cape Town some time before his death. The honorary degree Doctor of Literature (DLit) was conferred on him by the University of South Africa in 1919, and ten years later also by the University of Cape Town, where he had been a reader in aesthetics for some time. The title Monsignor was bestowed on him by Pope Pius X in 1921 in appreciation of his services to the Catholic Church. He was one of South Africa's greatest clergymen, and a great lover of children. When his health broke down in 1934 he was admitted to the monastry sanatorium at Sea Point, where he died at the age of 82. General Smuts described him as "A great man with a great brain, but simple, sincere, truthful and humble to the core of his being". Abernethy, O. Frederick Charles Kolbe. South African Journal of Science, 1936, Vol. 33, pp. xlix-li. General directory of South Africa, 1890/1, Clerical directory. National Automated Archival Information Retrieval System (NAAIRS). http://www.national.archives.gov.za/naairs.htm Documents relating to Frederick Charles Kolbe / F.C. Kolbe. Robertson, H. Biodiversity explorers. http://www.biodiversityexplorer.org/people Retrieved on 201-3-28. South African Association for the Advancement of Science. Report, 1903, 1905/6, 1908, 1910, 1915, 1917, 1918, 1919. South African Philosophical Society. Transactions, 1897-1907, Vol. 9-11, 16, 17: Lists of members. University of the Cape of Good Hope. Calendar, 1886/7-1917/8. University of the Cape of Good Hope (1899-1918) and University of South Africa (1918-1987). Register of honorary degrees conferred. Unisa archives.